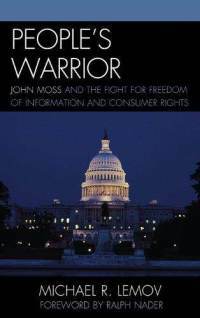 On October 3 2011, Michael R. Lemov author of People’s Warrior: John Moss and the Fight for Freedom of Information and Consumers Rights will attend a book signing at Busboys and Poets. People’s Warrior is the best account to date of Representative Moss’s legislative battles to win the public’s right to obtain government information, consumer protections, federal safety standards for motor vehicles, and protections for securities in brokerage accounts. 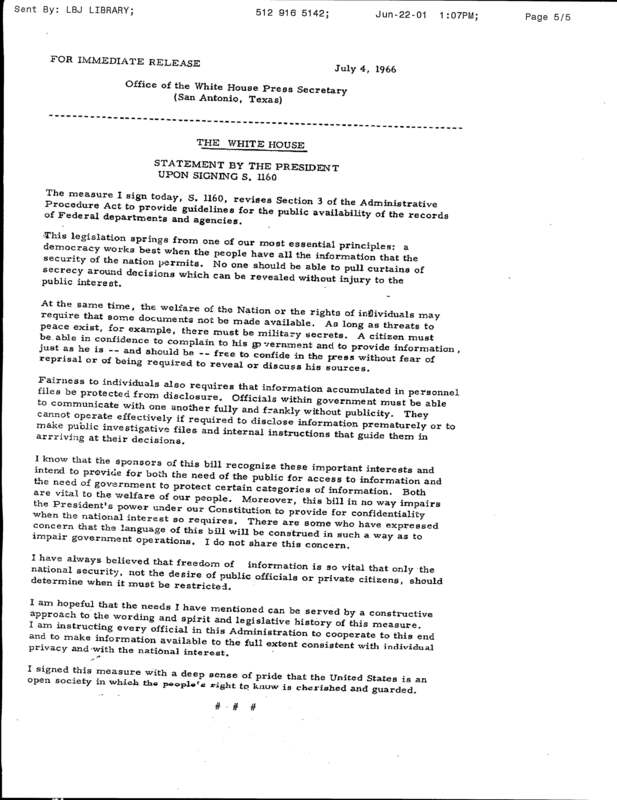 For FOIA advocates, Lemov’s treatment of Moss’s decades-long fight to pass the Freedom of Information Act –which was signed into law on July 4th, 1966– is especially riveting. Moss began battling excessive government secrecy in 1953, as a second-term congressman. In the midst of Cold War hysteria, the government’s attitude towards its records was, “when in doubt, classify.” The amount of peanut butter consumed by US forces was classified as secret, as was a twenty-year-old report about shark attacks on shipwrecked sailors. The Department of Justice once testified that FOIA would be “unconstitutional.” Now they implement it. The movement against what Moss called “silly secrecy” was bolstered by a report funded by the American Society of Newspaper Editors, entitled “The People’s Right to Know.” It was authored by Harold Cross, a leading newspaper lawyer, and counsel to the New York Tribune. Cross –who was supported primarily by the American press—declared, “Public business is the public’s business. The people have the right to know. Freedom of information is their just heritage. Without that, the citizens of a democracy have but changed their kings.” Newspaper editors and writers were the first to publicly advocate for a mechanism to give the public access to the government’s information. Moss took advantage of these cries for access to information. The junior Congressman plead his case and was somehow able to secure the support of House Majority Leader John McCormack and Speaker of the House Sam Rayburn to establish a new, Special Subcommittee on Government Information. In June 9, 1955 Moss was named chairman of this subcommittee. Soon, it became the known simply as the “Moss Subcommittee.” It’s primary task was passing a law to allow public access to government documents. This law would become the Freedom of Information Act. 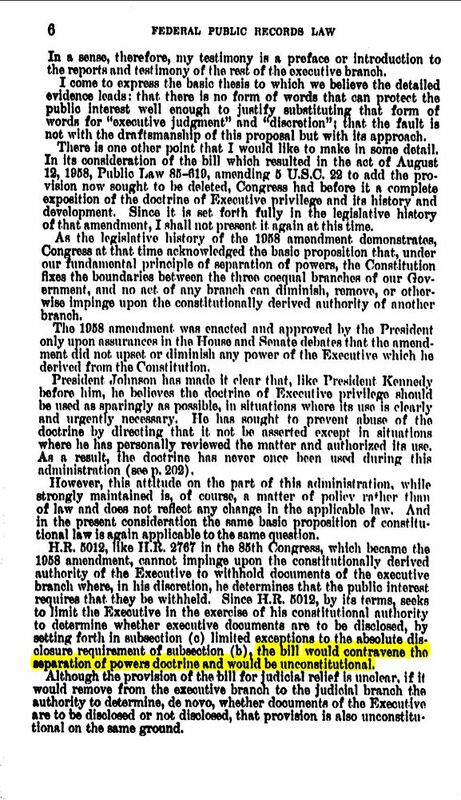 Despite these objections of the agencies, on June 20, 1966 –after a ten-year battle which spanned the Eisenhower, Kennedy, and Johnson administrations–the Freedom of Information Act unanimously passed the House and Senate. 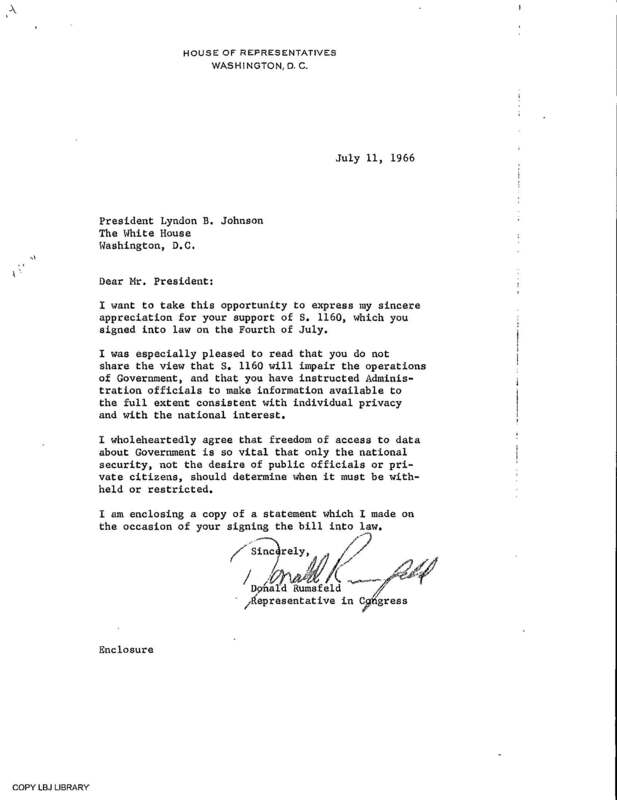 President Johnson –after showing signs he might veto— quietly signed the bill into law on July 4, 1966. The end of a ten-year struggle. When Representative Moss opened his final round of hearings on the Freedom of Information Act, he noted“the unfortunate fact that governmental secrecy tends to grow as government itself grows (page 9).” Now, thanks to his efforts, the public has the mechanism to breach this secrecy. And thanks to Michael Lemov’s efforts, we have the definitive account of Moss’s ten-year struggle to make the Freedom of Information Act law. ← Document Friday: State Department Poll in Pakistan Showed “Strong and Growing Public Support for Taliban”… IN NOVEMBER 2001.